Soon you’ll be able to register .tel domain names existing solely of two or more digits. This week ICANN’s Board of Directors agreed to amend its registry agreement with Telnic to allow for the numeric domain names. Telnic requested the change through the Registry Service Evaluation Policy (RSEP) process, which opened up the proposal to public comments. Go Daddy filed comments opposed to Telnic’s plan. The registrar argued that the change was not a new “registry service” and was a “fundamental change” to .tel’s charter. fact. Telnic’s promise not to allow numeric only second level registrations was a fundamental aspect of its application and, if we understand the decision correctly, a primary reason why .tel was awarded to Telnic and not Pulver (numeric only second level names were fundamental to Pulver’s application for .tel at the same time). We believe that certain other recent requests under the guise of the RSEP by sTLDs were also likely inappropriate for similar reasons and we are concerned about what appears to be a growing trend to misuse the RSEP. We hope our comments will encourage Staff and Board to review these requests more critically in the future. Also on this week’s board agenda was to approve number-only .name domain names, but I cannot find a resolution on this topic. A look at end of year numbers for .tel and .asia. With .tel recently going through its first annual renewal period, and Telnic’s official numbers for end-of-year 2009, I thought I’d compile some stats on the new top level domain. While we’re at it, let’s examine the numbers for .asia as it enters its third year. Analyzing .Asia and .Tel Domains: What does it mean for new TLDs? .Tel travels into “renewal valley”. How will it come out on the other side? The folks at .tel registry Telnic are certainly sweating this week: .tel domain names registered during general availability are hitting their first renewal period. I call this period — when new top level domain names hit there first renewal period — the “valley of renewals”. Renewal raters during this critical time are a barometer for how the TLD is doing as a whole, and the rate can often signify the future of the domain. When dotMobi hit its first renewal period it lost 10% of its registration base, similar to many other domains. At the end of last year there were about 275,000 .tel domain names registered. With $35 million invested in Telnic, the base of registered domain names will hardly support the valuation the company must have reached. It needs to grow and it needs to grow quickly. Pay attention to this renewal period to see where it’s headed. My guess is that many of the people who registered domains this time last year will renew for another year before making a judgment call. I renewed 100% of my .tel domain names: all one of them. Domains that aren’t used for web sites to get Google ads. 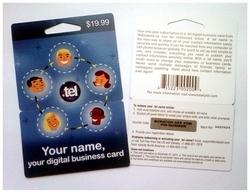 .Tel registry Telnic announced that .tel domain name owners will soon by able to integrate Google Adsense into their domain names. That means they’ll be able to add Google’s pay-per-click ads to their .tel domain names through the .tel management interface. The net effect? You’ll be able to turn a .tel into a parked domain name full of ads. Technically, .tel users have been able use ads on their domains for awhile, thanks to TelAds. This system allowed users to add their own sponsored ads, but not take advantage of a vast ad network such as Google. Of course, .tel domains get little type-in traffic. But with other content modules inside .tel, a user could conceivably add content, get ranked, and earn some advertising revenue. Google Adsense will be enabled on .tel domain names by the end of March. Telnic may ad more ad networks in the future. .Tel is also working on a page redesign for March. Here’s how the new pages will look. New gift card lets retail shoppers pick up a domain name on impulse. You can register domain names through web sites, twitter, and text message. So why not buy one with your latte? A new gift card from Canadian domain name registrar WebNames.ca lets customers buy a voucher for a .tel domain name at the cash registrer and then redeem it online. The card is apparently being offered (or soon will be) at CanTalk Wireless and Blenz Coffee in Canada. A number of domain name registrars, including heavyweight Go Daddy, offer online gift cards. But I’ve yet to see domain name gift certificates offered in retail stores, at least not in the U.S. If you’ve seen something like this elsewhere, please post a comment. By the way, it’s too late to register DomainNameGiftCertificates.com. Internationalized domain names on their way to .tel. Internet Corporation for Assigned Names and Numbers has approved Telnic’s request to offer internationalized domain names on .tel. .Tel registry Telnic made the request to offer IDNs on December 2, and ICANN Chief gTLD Registry Liaison Craig Schwartz notified Telnic of approval today via letter. By offering IDN domain names, users will be able to register .tel domain names in their native language and character set, as opposed to only roman characters as are currently available. Telnic has not released a timeline or plans for which character sets may be initially added. This is different from the recent initiative for IDN top level domain names, which will allow non-roman characters in the top level domain. ICANN’s approval pertains to the second level domain, and users will still have to type .tel. There are currently about 240,000 active .tel registrations according to HosterStats.com. Offering IDNs could give the top level domain name a much needed boost. Will IDN Top Level Domains Kill Existing IDN Domain Names? Poor IDNs. The Media Will Never Understand. .Tel registry asks ICANN to let it register IDNs. .Tel registry Telnic has sent a letter to ICANN CEO Rod Beckstrom requesting permission to issue internationalized domain names (IDNs). The letter (pdf) from Telnic CEO Khashayar Mahdavi requests ICANN authorization to release domains that contain hyphens in the third and fourth positions from the pool of reserved domains in the .tel registry agreement. This would enable IDNs. In his letter, Mahdavi writes that Telnic will follow the “Guidelines for the lmplementation of the lnternationalized Domain Names” as published on the ICANN web site. .Mobi recently released Chinese IDNs, resulting in a quick growth of the registration base by 100,000 domains, or about 10%. Bill probably meant to regulate .uk but could ensnare .tel. A bill introduced in the United Kingdom Parliament would have potentially adverse effects on domain name registries operating out of the United Kingdom. The Digital Economy Bill includes clauses that would allow the government to essentially nationalize a domain name registry that met certain qualifications of “failing”. Although the bill was probably meant to target .uk registry Nominet, it was written broadly enough to ensnare any other registry operating out of Britain, including .Tel registry Telnic. The domain name system is a crucial element in the Internet economy. It is the addressing system for the Internet. For years, the domain name industry in the UK has been self-regulated and this has largely worked well. However, there have been reported abuses of the domain name system in the UK, largely regarding the .uk country code Top Level Domain, such as cybersquatting (registering and occupying a domain name that might reasonably belong to somebody else in the hope of making a profit when selling that address), drop-catching (waiting for ownership of a domain name to expire and quickly re-registering it, sometimes before the current owner realises it), pressure sales of domain names, domain names used for phishing and distributing malware, and instances where foreign owned (and hosted) web sites with a .uk domain name dupe people into believing they are British. Although it’s clear the intent is to exert control over Nominet, the wording would also apply to Telnic. Clause 2, section 18-20 defines how the government could insert a new board and effectively take control of a “failed” registry under the bill’s definition. Yahoo picks up .tel domain name. An arbitrator with National Arbitration Forum has awarded Yahoo! the Yahoo.tel domain name. Yahoo was the first major tech company to file arbitration for a .tel domain when it filed its case back in August. The respondent in the case did not file an official response. Instead, he challenged the authority of UDRP proceedings in Spain. Through correspondence dated September 23, 2009, the Attorney of Respondent submitted a written communication to the National Arbitration Forum, by means of which said party emphatically insisted that this Panel lacks of competence to rule the present case, pursuant to internal provisions of the procedural Law of the Kingdom of Spain. Regardless of the foregoing assertion, Respondent is hereby reminded that it expressly consented to be bound to the jurisdiction of the UDRP when it executed the Registration Agreement with the Registrar implying this that Respondent is legally linked by the ARSYS INTERNET SL d/b/a NICLINE.COM registration agreement. Thus, Respondent is compelled to revise it and be properly informed of its content and implications, before making pointless contentions. Upon notification of the dispute, the Registrar refused to verify the Respondent’s identity. Upon subsequent request, the Registry did verify Respondent’s identity, and the National Arbitration Forum commenced the case. Then, after the commencement of the case by the National Arbitration Forum, correspondence was received from the Registrar that stated that the language of the Registration Agreement was in Spanish. In view of this fact, because the pertaining information was received from the Registrar only after the case was commenced, the Panel decides to continue the case with the English-language submission of the Complaint, pursuant to Rule 11 of the Policy. Of course, Yahoo could have claimed the Yahoo.tel domain name during the .tel sunrise period for about $300, much less than the cost of arbitration. Will we see a lot of this scenario — company doesn’t get domain during sunrise but gets it through arbitration — when new top level domains roll out?